In this age of Quick Buck Rules we would do well to remember those who have imparted their wisdom and learning as we career en route through the stations of life’s long (or short) journey. Nicholas Ward studied at Lowestoft then went to St. Martin’s during the 1960’s. After this he spent three years doing post-graduate studies at the Royal Academy Schools, where amongst other things, he was awarded the Eric Kennington Prize for Drawing. 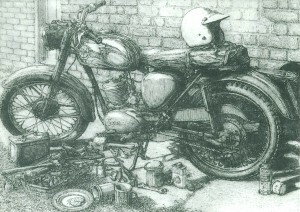 An avid British motorcyclist, Mr. Ward’s work has always been based on his love of drawing as inculcated by the Greenham era at the RAS. Ward has produced many etchings and owes his early interest in the medium to the input of staff at the Schools, especially Jackie Biddulph. Below is an example of his work: ‘Bantam Maintenance’, etching and aquatint. To see a comprehensive online show of Mr. Ward’s work, visit: http://www.birchamgallery.co.uk/magazine/nicholas-ward-etchings/ But do come back sometime! Ward left London and settled in his native East Anglia, where he taught drawing to students at Great Yarmouth College of Art & Design. He is best remembered for his relentless pillorying of the late caretaker George Mather – and for always being willing to demonstrate what he was ‘going on about’. 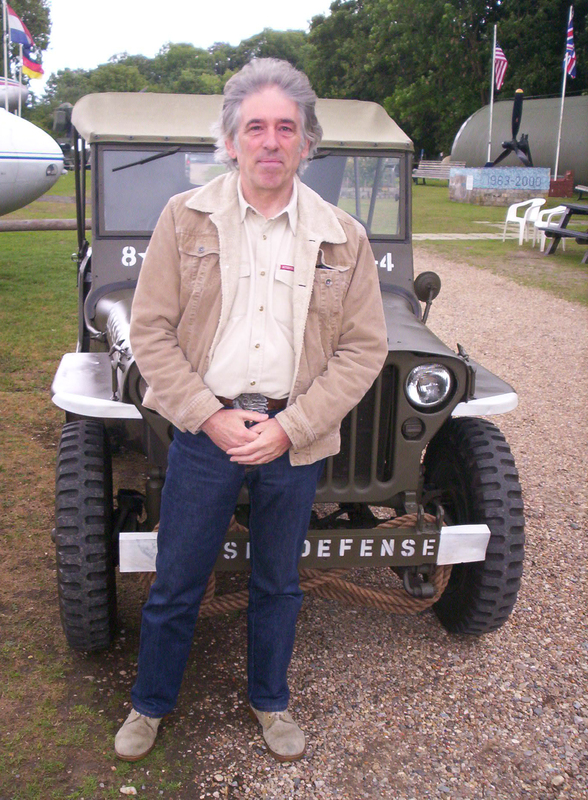 Nick Ward currently lives in East Anglia with his wife Liz. He illustrates for Classic Bike Magazine and has become an RE (not Religious Education). I have a sketch of Berney Arms Mill on the Norfolk broads signed N.Ward,Am I to presume this is the same person as described above. it is very likely that the sketch you have is by Nicholas Ward, as described here. If you could send me a scanned copy or a link to an uploaded image of it I could quickly confirm whether or not it is by Mr. Ward. I have just found out that the lovely Barry Drake has died and in trying to find a picture of the GT Yarmouth art college I have found your site. I have a signed etching print by Barry Drake. i believe he was a pupil of my late father, George Watson, who taught painting and drawing at Gt Yarmouth College of Art in the early ’50 s. My father’s untimely death in 1955 pre dated this picture, which I believe my mother purchased at a later date. thanks for your message. I’ve been unwell, hence the delay in responding. It would be interesting to see the etching, if you are able and willing to send a scan of it? See etchings by Nick Ward at the Bircham Gallery online, very good. Drake, Hughes, Newlands, Giles, Simons, huff (?) Parry, old Uncle Tom Cobbly and all! I will pass your comments on to Mr. Ward and thank you for them. It’s a shame GYCAD was dispensed with, for a while I ran a blog about it referring to it as ‘Yarmouth’s greatest export’. Anyway, hope you are doing well. Keep in touch, best wishes from Alan Dedman. Great photo of Nick Ward. He tried to teach me printmaking in 79/80 but with a smashed up wrist from a motorbike accident, it was difficult to say the least. I go to Gt. Yarmouth often but alas no more art school. No NORCAT either,as we knew it. I ended up being a tutor there with Tony and Anne working with Dons students as he was on secondment. Thanks for the great memories. 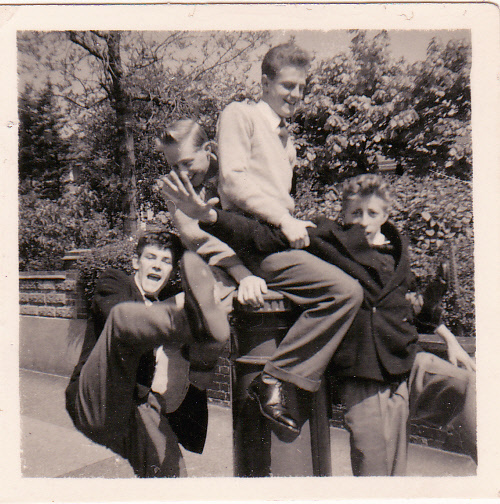 The Late Great Fabulous Barry Drake is my Dad. Sadly he died a few years ago now in 2013, but the Legend lives on in our hearts and our memories. It’s great reading all the comments above and all the names mentioned are very familiar from my childhood.